"Amazing detail. One of my favorites from the show "
"Mine arrived today and it does look extremely nice. It looks so much like Arya's. The only complaint I have is that the hilt is a little bit crooked, like in a slight "U" shape. But you hardly notice and I still love it! Thanks again, VS! VS NOTE: The crooked is intentional, the prop has that shape." "Exactly like the 'actual' Needle, aside from not having any dried blood on it! And just in time for my birthday, Halloween. 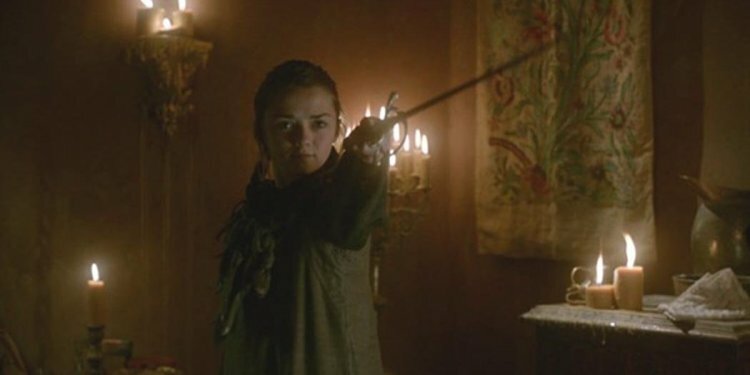 Thinking of dressing like Arya and going trick or treating with Needle, but that may not be the right look for a 6'2" 200 lb. male. Still, if anyone objects I can always 'stick em with the pointy end!' It's been a long wait for show Needle (I now have both) but worth the wait. Thanks." "I just received my needle #0114 today. It is just as wonderful as all my other swords from Valyrian Steel. It was totally worth the wait. Apparently there someone else with the same number as mine in the comments. I'll have look into that. Great sword though. VS Response: VS0114 is the SKU, not the edition number. " "I recently received mine and it is awesome!! I got #300, and that was a pleasant surprise. I love everything about it. It is quite possibly my favorite one to date. My only qualm is that the handle seems to have a slight curve to it. The blade is straight, but the handle is slightly bowed. I don't know if it is supposed to be like that, but besides that, this thing is awesome!!! It looks great on my wall next to Oathkeeper. VS RESPONSE: The handle is supposed to be, we get a lot of questions about this but it is intentional, the prop has that curve so we copied it." "just beautiful, and Arya\\\\\\\\\\\\\\\'s sword!" "The quality could be a little better, but it\'s still freakin\' awesome! It\'s been a long wait. I\'ll be swing it when the show starts back up! Who wants some!" "Overall, this is a fine product just like the other swords produced by VS. I am very pleased with the way the sword turned out, and from afar it's looks flawless. However, I do have one complaint: the pommel. The pommel is tilted to one side and looks really uneven from every angle. After you notice it, it's really hard to not see it every time you look at the sword. I knew the hilt was going to be curved, as preivious reviews have stated and VS has confirmed that the original prop had this issue. I can only wonder if the original prop had the same issue with the tilted pommel? I assume this must be the case as both of the swords I received have the same issue with tilted pommels. I understand VS is being faithful to the props when they replicate these types of errors, but honestly I'd rather own swords that are true to the INTENTION of the prop designs rather than obvious flaws that become eye sores once you notice them. At the end of the day, I love GoT and VS and I will continue to purchase from them. I just thought I would give my 2 cents on the issue." "I have previously bought and was %110 delighted with: Damascus ICE, Damascus OATHKEEPER, ROBB STARKS SWORD with SCABBARD, LONGCLAW with SCABBARD, JAIME LANNISTERS SWORD, And the absolutely beautiful LANNISTER SHIELD. (Side Note: All of my blades are SHOW blades rather than BOOK ones) After a longggggg wait my copy of the new NEEDLE was finally delivered. Now first let me state that I am one of V.S. 's biggest champions. However, when I beheld NEEDLE for the first time despite the perfect overall design there was one aspect of it that to me was surprisingly disappointing. The blade on this sword is more rounded than flat and the point is as sharp as a #2 pencil eraser. I realize that none of the other sword collectibles here are sharpened but they do have a dull, thin, edge and a sharp point. This blade has NO edge and NO sharp point. While weilding this otherwise finely made weapon I still find it hard to believe Arya being able to slide this into a pudgy stable boys guts and a mans throat as easily as a hot knife through butter if her NEEDLE had the same blade as the one this recreation was made with. I guess the contention I have with this is mainly due to already owning every other SHOW sword V.S.has released thus far and none of them have had this design issue which only leaves me to ruminate on the decision V.S.arrived at to differently design this one sword with the iconic tag line "stick them with the pointy end". Despite my rant which some may read as nothing more than a trifling quibble, even had I known of this design quirk beforehand I still would have purchased this sword. Hanging on the wall it is a work of art and perhaps one of the top 3 most iconic blades in the series. I will also be eagerly purchasing the scabbard for NEEDLE immediately following the conclusion of this writing. I submit this review chiefly for the purists out there and the wisdom of the old adage "Caveat Emptor"."